Producing clean energy and purifying water; these are the two main challenges that human life is posing to the world. Neither are easy or cheap tasks with today's technologies, but what if there was an inexpensive, abundant material that could achieve both? What if that same cheap material went even further, and could produce hydrogen gas for fuel, and filter waste water into clean water? As it happens, this material already exists, at least according to a group of researchers from Nanyang Technological University (NTU), led by Associate Professor Darren Sun. 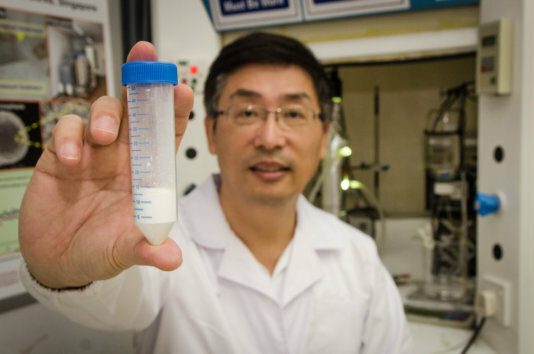 Sun and his team have been working for the 5 past years on building a nano-material that functions as an anti-bacterial water filtration membrane using Titanium Dioxide (TiO2). It is formed by turning titanium dioxide crystals into patented nanofibres, which can then be easily fabricated into patented flexible filter membranes which include a combination of carbon, copper, zinc or tin, depending on the specific end product needed. But while developing the membrane, Prof Sun's team also discovered that it could act as a photo catalyst, turning wastewater into hydrogen and oxygen under sunlight while still producing clean water. However, the new material continued to amaze Sun and his team. Not only can titanium dioxide particles help split water, it can also make water filter membranes hydrophilic - allowing water to flow through it easily, while rejecting foreign contaminants - including those of salt - making it perfect for desalinating water using forward osmosis. And if that’s not enough, Prof Sun's research projects have shown that when treated with other materials or made into another form such as crystals, titanium dioxide can have other uses, such as in solar cells. By making a black titanium dioxide polycrystalline sheet, Prof Sun's team was able to make a flexible solar-cell which can generate electricity from the sun's rays. "With such a discovery, it is possible to concurrently treat wastewater and yet have a much cheaper option of storing solar energy in the form of hydrogen so that it can be available any time, day or night, regardless of whether the sun is shining or not, which makes it truly a source of clean fuel" said Prof Sun. "As of now, we are achieving a very high efficiency of about three times more than if we had used platinum, but at a much lower cost, allowing for cheap hydrogen production. In addition, we can concurrently produce clean water for close-to-zero energy cost, which may change our current water reclamation system over the world for future livable cities." Sun promises that the manufacturing process will be easy and cheap. No word yet on the costs, but a Nano-material that can do all of this and more can surely convert today's waste into tomorrow's resources and revolutionize the world we live in.